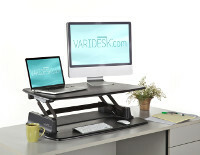 Varidesk products are some of the most popular sit-stand desks available in the United States and Europe. This article gives you comparison information on 4 of the most popular models so you can choose what to purchase. Varidesk has done some good work in the ergonomics department with the Plus models, as the keyboard is on a lower surface than the monitors. The problem is the height difference is one-size-fits-all. You will be hard pressed to get the monitors and keyboard in the right position for both sitting and standing. On the plus side, no mounting/assembly or worries about compatibility. This and the single below were the two first models of Varidesk. They both perform very good and people love them. You just have to be willing to manually switch your keyboard from the work-surface to the desk-surface each time you lower the device. This is one of the biggest changes made for the Plus line listed above. 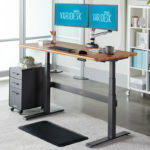 Varidesk, often misspelled as Veridesk, is a manufacturer of one of the leading types of standing desk converters on the market today. 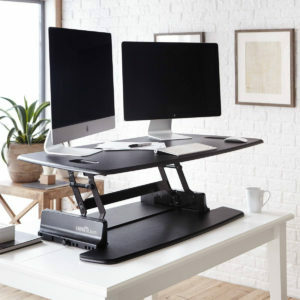 These standing desk converters come in handy if you already have a desk that you want to keep using, or if you work in a cubicle and want to try using a standing desk – opposed to something like these Adjustable Height Standing Desks – which are designed to replace your current desk. In this article we take a close look at four of the Varidesk models starting with the Varidesk Pro Plus. 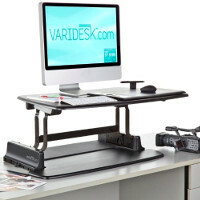 The Varidesk Pro Plus is the Cadillac of the Varidesk line of standing desk converters. 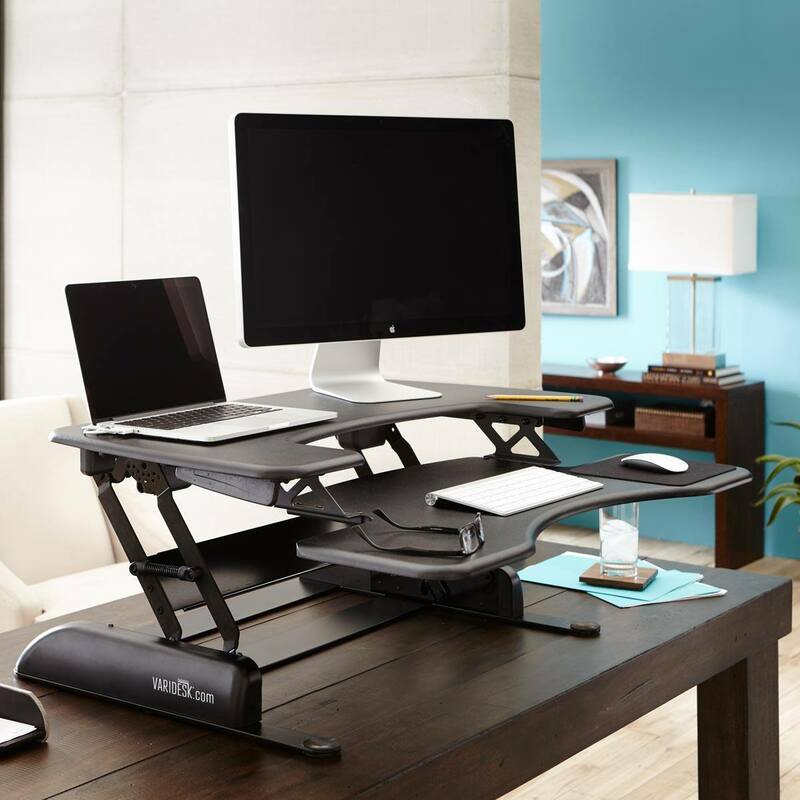 It is designed for those users who to spend some extra money to get additional features and ergonomics in their standing desk oriented workspaces. 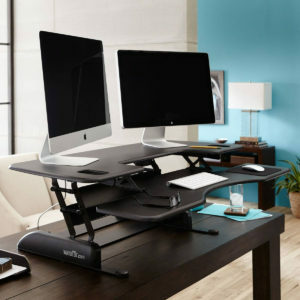 This unit exhibits and provides the same quality construction and sturdy work surface as all of the Varidesk standing desk converters reviewed on this list. Like the Varidesk Pro, the Varidesk Pro Plus includes a “reminder app” which prompts the user to switch to or from the seated or standing position. A “calories burnt” utility is also included in all pro-level models. The Varidesk Pro Plus supports dual monitors, but the space requirements of this particular unit are the greatest of all the models reviewed. Use of this unit necessitates a larger than normal overall workspace – standard cubicles aren’t going to cut it. While it isn’t too much of an issue with a simple mouse and keyboard combo, too many wired peripherals can cause some operational or workflow problems similar to the ones described in the review of the Varidesk Pro. Whether by habit or necessity, wireless peripherals are the way to go if the end user keeps a fully-covered desk. The standing height is quite generous, taller users may find the ergonomics of the Varidesk Pro to be somewhat unsatisfactory. This can best be seen in the relationship between the heights of the keyboard tray and monitor(s). Users over six feet (or those with exceptionally long arms) may find them to be almost level with one another. ** If you are interested in this model, but need something even wider. Make sure to checkout the review of the Varidesk Pro Plus 48. The Varidesk Single Plus is the step-up model for those ready to move beyond the entry level. Its compact size and ergonomic profile make it the best unit for everyday office use. While almost any PC monitor of standard dimensions will mate to this product, some may have troubles with the largest screens. 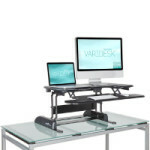 The Varidesk Pro unit is the first in Varidesk’s line of pro model standing desk converters. Both this unit and the Varidesk Pro Plus are designed for serious work with demanding space requirements and productivity thresholds. The Varidesk Pro comes fully assembled, and like the preceding model on this list, is a simple desktop machine with no mounting requirements. While nearly all PC monitors are supported, it is unclear (and thus assumed to be a negative) whether or not Apple products are supported. The Varidesk Single is Varidesk’s basic, entry-level model of standing desk converter, but don’t let that trouble you; it’s a great machine well-suited to casual home or office use. The keyboard tray / platform is awkwardly positioned; typing and other keyboard-intensive tasks can quickly become tiresome and aggravating. Brief overview of the Varidesk and a discussion of what it can do for you. Reminders to sit up straight and mind one’s posture – “Don’t slouch!”, “Sit like a lady”, and so on – are something passed down from the elders of society to its youth since time out of time. Everyone from Mary Poppins to habit-wrapped nuns in schools the world over have kept up the momentum, and even doctors have given their own weight to the cause of sound posture. And why not? After all, anyone who operates from a bad one for long enough will soon discover that they ache all over, that their abdominal muscles and upper body are weak (in comparison to what they should be), and that life is generally an uncomfortable affair. The ergonomics and yoga industries have seized upon this knowledge and used it to their advantage, blossoming in an arena that was once the sole domain of the chiropractor. For all of that, modern science and medical technology, though, have given us new insight into a critical fact: Slumped over or ramrod straight, if you’re sitting down, you’re on the road to ruin. The effects of long-term immobility upon the desk-bound, for example, can include weak musculature, poor posture, impaired breathing and circulatory function, and even (in severe cases) nerve damage or blood clots, which may in turn lead to heart attacks, deep vein thrombosis (DVT), and other life-threatening maladies and conditions. Given the prevalence of office jobs in modern society, the importance of a little activity in the workplace and in daily life cannot be overstated. The question is, how does a person do their work while avoiding the sedentary lifestyle? The answer is simple: The savvy worker uses a standing desk! Standing desks are just what they sound like – platforms that either replace or convert the traditional seated working platform into one that allows the user to do his or her work from a standing position. Aided by an anti-fatigue mat this allows him / her to do whatever work he / she would normally do while reaping all the benefits of a non-sedentary work environment. While all results are subject to some degree of variance, the results are almost universal: When compared to eight hours in a chair, standing desks improve both user health and productivity. Now that the “what” and “why” of the standing desk is established, let’s move on to the reviews! While not without their flaws, the Varidesk line of standing desk converters are, for the most part at least, solidly built, user-friendly tools which the end user will find greatly beneficial both in terms of health and productivity. Indeed, most models come equipped with utilities to track calories burnt as a result of standing desk use – feel the burn! Incidentally, if some of the pros and cons seem similar when the models reviewed are examined as a whole, it is only because of that same attention to detail and quality craftsmanship mentioned above – whether entry-level or top of the line, Varidesk doesn’t skimp or cut corners when it comes to baseline quality. This translates to many construction and materials-based features and characteristics overlapping. As for the negative side, there really isn’t one. 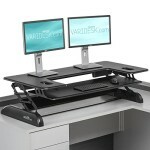 The biggest sticking points surrounding these Varidesk units are issues surrounding sometimes questionable ergonomics. The bottom line is this: The average user should have no problem simply taking any Varidesk standing desk converter out of the box and using it straight away. Enjoy! I bought the Varidesk Pro – it’s excellent, I haven’t really found any cons at all – well worth the money in my view. Hey Roy, thanks for the comment. I am glad you like it! What do you like best about the Pro? Did you consider the Varidesk Single? I’ve been using the Veridesk Pro for about 3 weeks now at work and I absolutely love it. It is such a change from the normal everyday sitting for an office setting! I was even able to get longer cords to accomodate the raise of my two monitors! The convenience of being able to raise the desk up and down is a plus as because there are still some things that need to be completed while you sit, but overall I’ll give it 5 Stars, 21 thumbs up!!! Definately something to purchase for those of you looking to make a healthy choice at work!!!! Thanks for the comment. I am super glad it is working out for you. At 6’5″ am I too tall to use this product? I’m wondering if I’ll get a sore neck if I have to look down at my monitors? Thanks for the comment. I can’t tell you for sure that you will get a sore neck, but chances are high. The problem is you won’t be able to get the monitor to above eye level. What you can try, to test if your body will handle it is to set a laptop on a counter-top and try working at it for a few hours. That should give you a good idea. 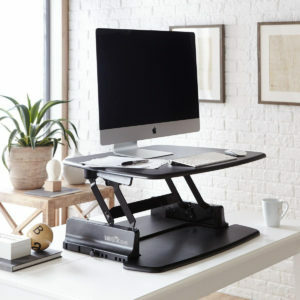 You may want to check out this product: http://notsitting.com/standing-desks/making-the-switch/taskmate-ez-6400-review/ It allows you to adjust the monitor separately and should help to get the proper height for you. Let me know if you have any other questions. I got the Veridesk Single Plus about 3 weeks ago and I am loving it. I have 2 monitors on it, one landscape and one potrait. It is great. My co-workers are circling like sharks. I got the single over the pro because my desk has a cabinet that would have taken out the second monitor (landscape) when I lifted it. I am very happy that this setup forced me to put my 2nd monitor in the portrait mode. Very cool. How do you like the keyboard tray on the Plus? Are you able to get it to the right position in both sitting and standing positions? Very much looking forward to purchasing one, but I can’t make up my mind about whether to get the “Single” or “Pro” model. I know that there’s only a 6 inch difference between “single” and “pro”. Right now I don’t have two monitors, just a single iMac i7 and Macbook Pro Retina, and a full size (including number pad) wireless keyboard (KB TalkingPro) and Apple wireless mouse. Will the Single give me enough room for a full size keyboard and mouse next to the keyboard? I use Microsoft’s Ergo Keyboard, they are large and weigh in at 20″ or so wide. Next to that I use a mouse pad that is 13″ wide (it is bigger than what I need, but I like it all the same). That puts my setup at 33″ or so. Either my mouse or keyboard (or both) would be hanging off by about 3″. That means that I could definitely manage with a single. I love my Vari Desk Pro. My colleagues have asked how it is able to hold the weight and not flip. I am wondering too! I am definitely no engineer haha, but I will give it a shot. If you notice that when you lift the unit to the standing position, the position of the worksurface moves forward (towards the user) during lift. This places the back of the worksurface more towards the middle of the base. Keeping the desktop from flipping. I work out of files…hard, paper files, often times. My job requires use of two monitors. Is there any space to place work papers on the Pro Plus? My monitors are 21″ wide. Do the monitors have to rest in the center of the Pro Plus, or is it sturdy enough that the monitors can sit back on the hind section? The monitors can sit on the back section of the desk, just don’t hang them on the edge. I am considering a Veridesk Single Plus because I have very limited space. I am not sure what you mean by “Single-monitor support only.” I have a 17″ laptop and a 18″ (diagonal) monitor. Veridesk e-mailed me that the surface area (excluding keyboard area) is 30″ X 15″ which seems plenty for my equipment. Before I order one, does anyone see a problem with this?? Also, I am assuming this device is either “up” or “down” and there is no stopping in between. Yes? No? THANK YOU!!! You can stop in-between, at whatever spot is most comfortable. As far as the width is concerned, I am hesitant to suggest the Single for you. Your monitor is probably 14-15″ wide, plus the laptop at 17″ puts you at 31-32″. That means that something will be hanging off, or you have to place one in-front of the other. I just received the Varidesk Pro Plus last week and absolutely love everything about it. It is solid & sturdy even at full height. I purchased the Pro Plus model to insure the keyboard tray would have enough room for the oversized Microsoft Ergonomic Keyboard that I have been using (and love) for over 10 years. It’s comes fully assembled and well protected in a wide and tall box. The shipping box is pretty heavy since Varidesk has done a remarkable job at packing and protecting it with tons of cardboard space fillers. I can’t say enough great things about the product. Now I need some feedback on a couple of standing mats. I’m considering the UpLift Standing Desk Mat 3′ x 5′ x 1″ since it can also double as a chair mat, and seems large enough to do so – but I cannot find any reviews on it. Is anyone here using this mat and how is the comfort level after an hour or two of standing? I purchased the pro plus, absolutely love it! I was worried it wouldn’t meet my needs quite right. It works perfectly except for one gotcha, the inadequate space for using a mouse and mouse pad. It was doable but a pain in my arse. if you know what i mean. I found a solution which i hope the manufacturer fixes for future buyers. I removed the keyboard tray, only eight screws, took it home, outlined it on a new piece of pressboard. I made the keyboard/mouse base part of it 11 inches deep. Painted it black with primer, drilled the eight holes with my drill, using the orional as a guide. Brought it back to work, and walla, problem resolved. The press board was 9$, can of black spray paint, 4$. Now there is plenty of space for mouse pad. Thanks for the Pro-tip! I am glad you like it. 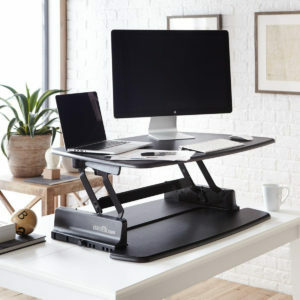 I’m looking for a good sit/stand solution that will let me keep using my current desk, and I’m having a hard time figuring out what might work well for me. The main thing is that I’m pretty short, so when I’m sitting down, I don’t want my monitors up any higher than they already are (the actual screen is 3.5 inches off the surface of my desk), and prefer my keyboard and mouse on the same surface rather than on a tray. The Varidesk would be great except it looks like even the lowest position would put another 3-4 inches between my desk surface and my monitors, and when I tested that height by putting a couple large books under my monitor, I ended up looking up at the screen and I got a bad neck-ache within just a few minutes. The solution to that, I suppose, is to raise my chair when I sit and get a footrest, but if I’m going to do that anyway, I might as well just convert to a standing setup entirely with a chair that can accommodate it. So I guess what I’m really looking for is a setup like the Varidesk that doesn’t raise the monitor so much when it’s in the seated position. I’m also looking at Ergotron WorkFit varieties, but they look like they might have the same issue…and of course price is always a factor (my boss would like me to stay under $500). Any suggestions? Possibly a bar stool would correct your problem. I like to sit occassionally and have found that one of my bar stools works great. I admit I’m a bit taller, but sitting up on the bar stool might correct the monitors being higher than you are. Just a suggestion. Looking for advice — I’m thinking of getting a Varidesk Pro Plus for a 27 inch iMac coupled with a 23 inch second monitor. By my calculations they should just fit space-wise, but together they weigh 17kg/37.5lbs, which is over the stated limit of 35lbs. Has anyone got a set up that has gone ‘over weight’ and if so have they had any issues? I’ve had my Varidesk Pro 36 for about a month. I’m 6’1′ and the multiple stations work well for me. My son is 6’6″ and he’s considering purchasing one for his work station . ANyway, the system is everything the advertising said it would be. I have one question, has anyone experienced an odor coming from their units. I had mine set up in my basement (for about 4 weeks) and all of a sudden I started experiencing an odor that smelled like insect spray. I started getting nauseaus and ill feeling after a couple of hours. This went on for a few days and after checking the basement by a professional heating air cond expert I decided to move the work station upstairs to my home office until we could figure out what the problem was in the basement. Just a day after I moved upstairs I started smelling the same odor although not as strong. Could be becasue my overhead fan is constantly running. ANyway, anybody out there experiencing anything like this. I love my desk but of course if their is a compound used in its construction that could be causing me distress, I’ll have to do something about it. Appreciate any comments. in my previous position as a HSE coordinator I recommended these for two employees who were already improvising standing versions, the varidesk was well received and both were wrapped with the versatility. They were single monitor versions. I am trialling the Varidesk Pro Plus 36 and find the monitor shakes when I use the keyboard (and I am not slamming it). I fear I am at risk of developing motion sickness when typing. I am 5 feet tall (short?) Do you think I can use it easily? Is the standing position a preset height or adjustable? My Doctor told me today I had DVT in my legs and I should start using a stand up desk. I had her write me a prescription. Has anyone been able to get insurance to cover the expense? Wishing I had not procrastinated and purchased it a year ago, next thing is to buy one for work. Kate I am 5ft 2 and I have no problems using it sitting or standing.